Congratulations to Anastasiia Misiura for passing her Qualifying Exam this week. We look forward to your accomplishments in the coming years. 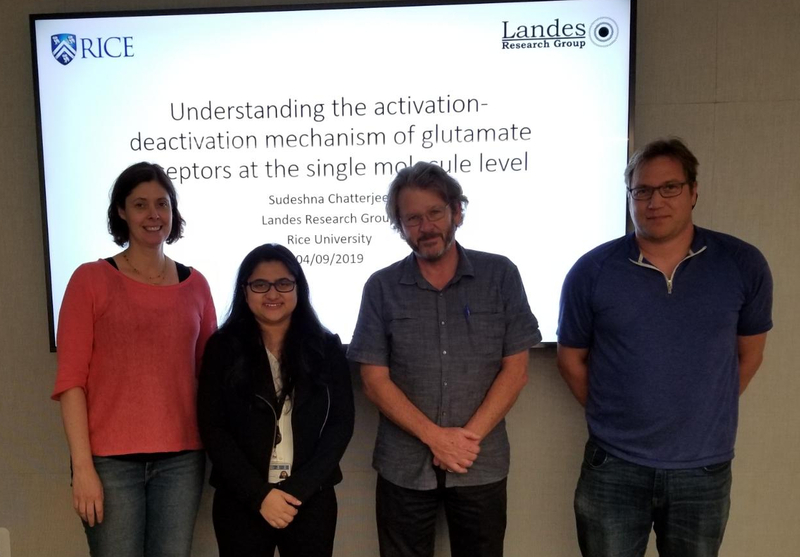 Congratulations to Sudeshna Chatterjee for passing her Thesis defense. Good luck in Portland Sudeshna! Congratulations to Wenxiao Wang, Nicholas Moringo, and Chayan Dutta for getting their newest publication featured in the press! We are happy to welcome our new Postdoctoral Researcher Min Zhou to the LRG Offices. What a great way to ring in the New Year! The LRG congratulates Wenxiao Wang on successfully passing his thesis defense. Good luck at Google, we know you'll do great! The LRG is officially out of Dell Butcher Hall! Stay tuned for pictures of all the exciting things happening in our new lab space! The Super Group hosted their yearly Christmas Party on Sunday. Good food and frivolaties were had by all. Happy Holidays! We are happy to welcome our new Graduate Student in Chemistry, Emily Searles, to our office. Good luck in the years to come! We are happy to welcome our new Graduate Student in Electrical and Computer Engineering, Jorge Zepeda O to our lab. We look forward to all of your future successes! We are happy to welcome our new Postdoctoral Researcher, Miranda Gallagher to the lab. We look forward to all of your future successes! Congratulations to Logan Bishop and Nicholas Moringo for winning awards at this years departmental awards ceremony. Keep up the good work! 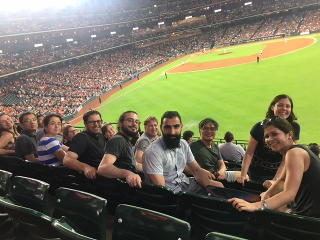 The Super Group went to watch the Astros beat out the White Sox. 'GO STROS! Congratulations to Charlotte Flatebo for advancing to Ph.D. candidacy! Congratulations to Wenxiao Wang for successfully proposing his thesis. Good luck with the work ahead! Congratulations to Rashad Baiyasi for graduating to Ph.D. candidacy. Congratulations to Logan Bishop on becoming a 2018 NSF GRFP Fellow! Congratulations to Logan Bishop on passing his Qualifying Exam! Good luck in the years ahead! We wish to welcome our new Group Admin Corina Knowlton. The Group would like to welcome our new undergraduate researcher Theresa Leibig. The Group would like to welcome our new postdoc Chayan Dutta to the group. The Group would like to welcome our new graduate researcher Anastasiia Misiura. Good luck on the research ahead! Congratulations to Nicholas Moringo on winning a Departmental Achievement award. 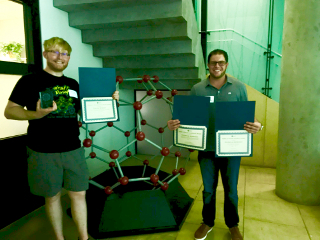 Congratulations to Logan Bishop and Nicholas Moringo for winning awards on their oral presentations in the Summer SCI Symposium. Congratulations to Charlotte Flatebo for being named a 2017 NDSEG Fellow. Also congratulations to Logan Bishop for being named an NDSEG 2017 Alternate Candidate. 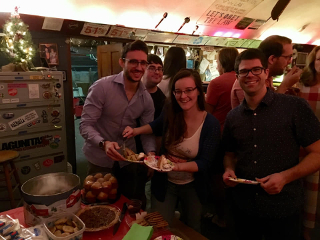 Congratulations to Nicholas Moringo on passing his Qualifying Exam! Good luck in the years ahead! Congratulations to Nicholas Moringo on becoming a 2017 NSF GRFP Fellow! Benjamin Hoener and Charlotte Flatebo won presentation awards in the 2nd Annual SCI Transdisciplinary Symposium. Congratuations to both! The Group would like to welcome our new postdoc Dr. Sean Collins to the Lab. Congratulations to Dr. Lydia Kisley on making Forbes' 30 Under 30 list for 2017! The group would like to welcome a new graduate student, Logan Bishop. We look forward to what you will do in the coming years, Logan! Congratulations to Sudeshna Chatterjee for winning a Harry B. Weiser teaching award for her excellence as a T.A. and the Stephen C. Hoffmann fellowship award for her outstanding qualifying exam! Way to go Sudeshna! Congratulations to Bo Shuang for winning the John L. Margrave Thesis Award in Chemistry for his great work while earning his Ph.D.
Congratulations to Rashad Baiyasi his award winning presntation at the First Annual SCI Transdisciplinary Symposium. Keep up the good work! Congratulations to Dr. Lawrence Tauzin on his successful thesis defense! 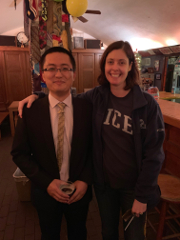 Congratulations to Dr. Bo Shuang on his successful thesis defense! Congratulations to Sudeshna Chatterjee on passing her Qualifying Exam! Good luck in the years ahead! Congratulations to Charlotte Flatebo on achieving Honorable Mention in the NSF GRFP! Congratulations to Dr. Christy Landes on winning the 2016 Early Career Award in Experimental Physical Chemistry from the American Chemical Society. We are all proud of Christy and the members of the Landes group contributing to this award winning research! Congrtulations to Chad Byers on his successful thesis defense! Welcome to two new graduate students, Nicholas Moringo and Charlotte Flatebo! Congratulations to Chad Byers for winning the Peoples Choice for his oral presentation and Dr. Hao Shen for winning a poster reward at the first annual SCI Summer Symposium. Congratulations to Dr. David Cooper on his successful thesis defense! Congratulations to Dr. Lydia Kisley on his successful thesis defense! The Group made an excellent showing at this year's Annual RQI Symposium with multipled members giving talks and two members, Bo Shuang and Rachel, winning prizes for their work. CHRISTY GOT TENURE!!! 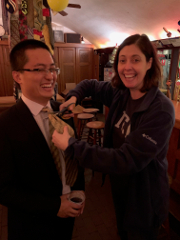 This past Friday, Christy was officially informed she would receive tenure at Rice. We here in the Landes group are, of course, thrilled with the news and want to offer our sincerest congratulations to Christy for this wonderful opportunity. Congratulations to Charlisa Daniels for taking a position as a Assistant Professor of Physical Chemistry in the Department of Chemistry at Northern Kentucky University. Congratulations to Carmen Reznik for her promotion to Supply Excellence Manger for Chemicals Business. Our friend and colleague Jixin Chen has accepted an offer from Ohio University as an Assistant Professor. We will miss him in our lab but wish him well on this next step in his career! Congratulations to Chad Byers for winning Best Pitch in Natural Sciences in the 90 second thesis contest! The Groups work on development of the super-resolution technique mbPAINT was featured in Rice News. On Friday, the annual RQI Summer Research Colloquium was held and the Group had a very strong showing. 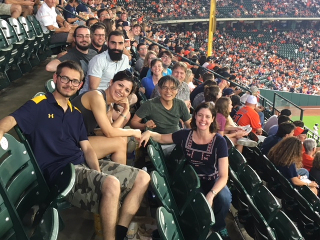 Alberto, Bo Shuang, Chad Byers, David Cooper, and Lawrence Tauzin all gave poster presentations on their most recent work, while Jixin Chen and Lydia Kisley were both selected to give oral presentations. Lydia Kisley's presentation titled 'Super-­resolution Imaging by Motion Blur Points Accumulation for Imaging in Nanoscale Topography (mbPAINT)' won this years Halliburton Award. Congratulations to Lawrence Tauzin and Bo Shuang for advancing to candidacy. We look forward to your future successes in the group! Congratulations to Lydia Kisley on becoming a 2012 NSF GRFP Fellow! Congratulations to Group undergraduates Julia Zhao and Andrea Mansur for their excellent presentations at the ACS Southwest Regional Meeting. Congratulations to David Cooper and Lydia Kisley for graduating on to Ph.D. candidacy. Congratulations to Dr. Nick Taylor on his successful thesis defense! Congratulations to Charlisa Daniels for passing her thesis defense! The Group is happy to welcome two new graduate students, Lawrence Tauzin, and Bo Shuang. Congratulations to Carmen Reznik for successfully defending your thesis. We will surely miss you in the years ahead! This year's Chemistry Departmental Awards Ceremony saw four members of the Group receive prestigious awards. Carmen Reznik, who graduated this year, won the illustrious John L. Margrave Thesis Award, which is given to the student with the best thesis each year. Nick Taylor received the Harry B Weiser Research Award for major research contributions in the chemistry community. Rosalie Berg was presented with the Zevi & Bertha Salsburg Memorial award in Chemistry, noting an outstanding undergraduate in the Chemistry Depatment. Finally, the George Holmes Richter Memorial Fellowship was awarded to Nick Uhm. Join the rest of us in the Group as we congratulate our award winners and look forward to another productive year.